I’d like to become the sort of person who only spells theater theatre. I’d like to place emphasis on the A, while I’m at it. But I’m not sure I can pull this off, as much as I’d like. I don’t even really like movies all that much. The concept of a Summer Blockbuster is lost on me. Who are these people who go to movies in the summer? Why are theaters even open then? Shouldn’t we only go see movies in the winter, when it’s cold outside and we’re hungry for popcorn? Why are we so drawn to bright lights and loud sounds? In spite of these concerns, I made my way to the new movie theater in Lake Geneva this week. It wasn’t because I wanted to go see a particular movie. And it wasn’t because I was uniquely bored. I wanted to go to see what this new space was all about. I wanted to see if the new group had dialed in the movie experience, which is, as I mentioned, an experience that I care very little about. I wanted to give the community a review of this newcomer, so I loaded my family into the car and pulled up to the Emagine Theater for the 5:10 viewing of The Meg. As I already said, I didn’t want to see this movie. But my daughter has an affinity for Jaws, and so the natural progression to a prehistoric killer shark was unstoppable. After a series of partially completed roundabouts we had arrived at the old Showboat Theater, just outside of Lake Geneva on Highway 120. The old theater was closed and subsequently sold, thankfully to the Emagine Theater group out of Michigan. 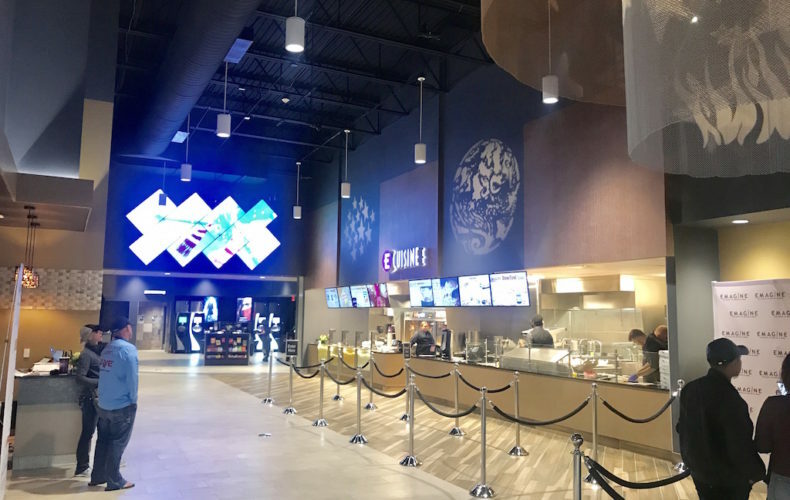 The website for Emagine promises that their theaters are luxurious and modern, with reclining seats and food service far beyond the typical popcorn and Mike and Ikes. They have a bunch of locations in Michigan and Minnesota, one in Illinois, and now one in Wisconsin. I had bought two tickets to this B movie on my phone earlier in the day. $28 for four tickets to the 5 pm show, including a $4 service charge. That charge, the woman at the ticket counter informed me, would be waved if I signed up for some $10 year long pass, or something. Since I’m not a regular movie goer, I didn’t listen to her. The interior of this old, boring building was sleek and modern. Fancy, almost. There’s a bar area with a fireplace (as I recall), a large concessions counter with hot food options and the typical movie fare. We ordered a pizza, which they told us would be brought to our seats, and popcorn. My kids pleaded for water, but why would I buy water in a bottle when there were perfectly good drinking fountains right there in the lobby? The service, as expected, was quite clumsy. No one seemed to know exactly what was going on, which didn’t bother me so much, as I was there only for the spectacle of the space. After we were directed to our particular theater, we took our seats. Well, they weren’t our seats, as the ones I picked out and paid for online were supposed to be in the middle of the theater and were, instead, located in the last row. No matter, we had the entire room to ourselves. The lack of other viewers may have been because it was their second night open, or because it was a 5:10 show on a Wednesday, or because we were watching The Meg. I couldn’t be sure. The popcorn was good, and when the pizza was brought out it wasn’t terrible. Too much cheese and the sauce was odd, but overall it was fine and we ate it all rather quickly. The screen was large and crisp even if the pizza was not. The seats were large and leather, capable of a full recline. I nestled into my chair, tilted it back, and marveled at all of the years we suffered through stiff-backed movie chairs. How awful things were for us back then. The new theater is nice. It’s better than any area theater by miles, and likely rivals the very well appointed Marcus Theaters in New Berlin. It’s a good thing for the community, a good thing for the immediate area of that new Highway 12/120 interchange. Unfortunately, this new place will deliver the death blow to the Geneva Theater downtown Lake Geneva. If you’ll recall, that old downtown theater was renovated in just the past two or three years. I was glad to see the renovation, as the space was too visible to go unkempt ad unimproved. While the exterior of the building looks nice, even if a bit art deco-y for my taste, the movie experience there is rather mediocre. The seats aren’t the fancy new style, the screens are small, and the common areas boring. There was a great opportunity here to deliver a unique product, instead, the group took some city money and performed a relatively low end renovation. If this group doesn’t transform the Geneva Theater into a live music/live plays type venue, it’s going to fail, and soon. With the shiny new Emagine theater down the road, they don’t stand a chance.